What Does Surgery for Tennis Elbow Entail? 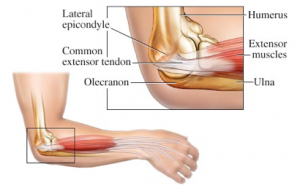 Tennis elbow, also known as lateral epicondylitis, refers to the inflammation of the forearm muscles on the outside of the elbow.
. This condition is not limited to tennis players, but can occur in any work or recreational activity that deals repeated stress to the elbow joint and forearm muscles. Studies have shown that tennis elbow is most commonly caused by overuse of the forearm muscles. The repeated stress received by these muscles leads to microtears in the tendon found at the attachment to the epicondyles. Over time, these microtears get inflamed, causing swelling and pain. Scottsdale orthopedic surgeons diagnose tennis elbow after a complete medical history and physical examination, although they may request additional imaging studies like X-rays, Magnetic Resonance Imaging (MRI) and Computerized Tomography (CT) scans. Initial management of tennis elbow is always conservative and nonsurgical. Aside from physical therapy and rehabilitation, physicians may attempt medical interventions such as steroid injections and extracorporeal shock wave therapy. However, if these prove ineffective after 6 to 12 months of treatment, surgery may be recommended. The objective of the surgery for tennis elbow is to remove damaged tissue and reattach healthy muscle and tissue back to the bone. However, there are several options for the specific type of surgery depending on the nature and severity of the injury. Arthroscopic surgery allows the visualization and repair of the elbow joint with only small incisions. This allows for faster healing and recovery times, with outcomes comparable to other types of surgery. Arthroscopic surgery of the elbow should only be undertaken with an experienced elbow surgeon in Phoenix or Scottsdale such as Dr. Adam Farber. Open surgery is usually reserved for larger injuries that require direct visualization and repair. Surgery, however, entails risks of adverse outcomes, such as infection, intraoperative nerve or muscle damage, blood loss, loss of strength or flexibility, etc. Recovering from the surgery will require a program of physical therapy and rehabilitation. The arm may be initially immobilized prior to starting the program of physical exercises. Strengthening exercises will be progressively implemented and may begin within two months after surgery. The physician and physical therapist will guide the patient throughout this program of recovery. Eventually, most patients recover enough functionality in their elbows to go back to sports and other athletic activities. Surgery for tennis elbow enjoys an 80% – 90% success rate, although it is possible to see a loss of strength.